RT America: Monsanto makes rats grow tumors; are humans next? In a recent French lab study, rats that were fed genetically modified foods had a tendency to develop tumors and suffer severe organ damage. GMO’s have become a hot topic in the United States and in California people are demanding GMO food be labeled in the state. Many consumers feel humans will suffer the same fate as the lab rats and are hoping to put a stop to GMO food. Alexis Baden-Mayer, political director for the Organic Consumers Association joins us with more on the startling consequences and why Americans should be aware if they are buying GMO foods or not. Alexis Baden-Mayer, political director of the Organic Consumers Association, was recently on RT’s The Big Picture with Thom Hartmann. Take a moment to watch this segment & share it with your Genetic Crimes Unit. America’s Congress has been contaminated, but don’t worry — someone is already on it. Members of Occupy Monsanto, a protest group opposed to the biotech giant, are dispatching aid to the nation’s capital. 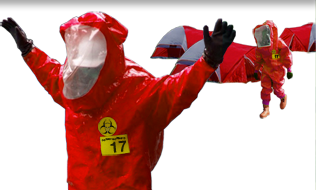 Dressed in hazmat suits, members of Occupy Monsanto protested in Washington, DC on Friday over what they say are corrupt ties between American lawmakers and the country’s agriculture architect, Monsanto. Based in the American Midwest, the Monsanto corporation is believed to be aiding in the bankrupting of small-time farms across the country by chemically engineering genetically modified seeds that are not just unnatural, but near impossible to compete with. Concerned over the toxic make-up of their man-made crops, as well as their corrupt connection with the US Congress, the Occupy Monsanto group is in Washington this weekend to make their voices heard. “In the name of Wall Street profits, chemical corporations such as Monsanto genetically engineer crops to withstand high doses of their toxic weed killers that contaminate our food and water, and have not been proven safe,” explains Occupy Monsanto’s Ariel Vegosen in a statement made this week. 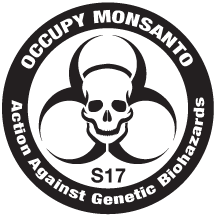 In addition to participating in the protest group, Vegosen is a member of the Genetic Crimes Unit, or GCU, an offshoot of the Occupy clan considered to be their “agents of change” that take to the streets to rally for awareness of the actions regularly engaged by Monsanto. In addition to buying out small-time farms that can’t compete with the billion-dollar biotech corp, Monsanto is also being accused of buying off Congress to let the company get away with feeding America genetically modified foods, or GMOs. As RT reported earlier this week, Monsanto was recently awarded federal approval to test out a lab-developed corn variant that is believed to be resistant to arid environments and droughts. 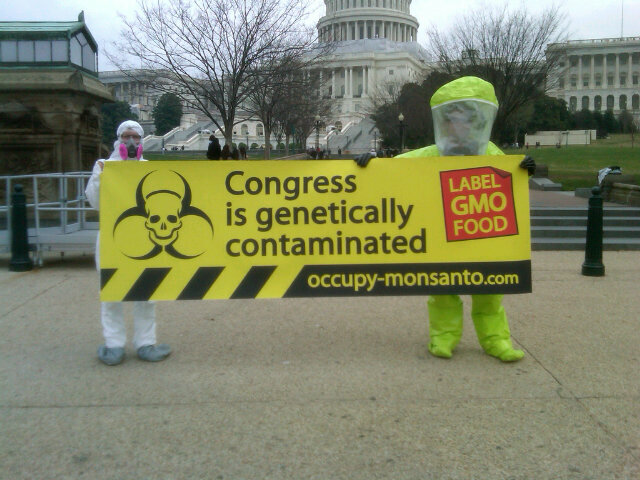 Occupy Monsanto rallied outside the Cannon Building in Washington’s Capitol Hill on Friday, where hazmat suit-clad GCU officers identified victims of genetic crimes. Other protests were planned around the world to be held at the same time, including demonstrations in Los Angeles, Seattle, Düsseldorf and Winnipeg. In September, Occupy Monsanto is planning an even larger global protest that it says will become a day the biotech firm will never forget.